Address: Guangdong Institute of Microbiology, No.100, Xianlie Road, Yuexiu District, Guangzhou City, China. To elucidate ozone action mechanism, cell suspensions of E. coli 8099 and S. faecalis ATCC29212 were initially exposed to ozone for 5 min, and then treated with sodium dodecyl sulfate, sodium hydroxide, and proteinase K. Results showed that, after ozone treatment, OD600 reduction rates of E. coli cells were 6.11±1.29%–7.06±1.23%. And those of S. faecalis were 7.95±2.81%–55.85±1.43%. After ozone pretreatment, OD600 value of E. coli cells, sequently treated with SDS, NaOH, and PK, decreased by 8.83±1.86%, 34.72±0.42%, and 10.42±2.08%, respectively. And that of S. feacalis decreased by2.85±3.63%, 71.30±1.08%, and 7.00±2.47%, respectively. Therefore, ozone pretreatment made E. coli cells be sensitive to SDS and NaOH, not susceptible to PK. It was confirmed by transmission electron microscopy of E. coli cells. 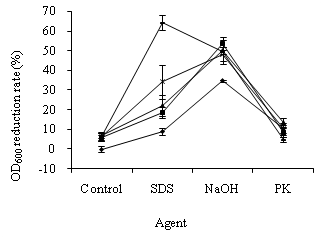 To S. faecalis, ozone pretreatment activated the effects of SDS, NaOH, and PK on cells. ATP loss from S. faecalis cells indicated that ozone damaged cell membrane and increased membrane permeability. Because SDS-, NaOH-, and PK-induced cell lyses were respectively due to protein denaturation, cell membrane damage, and the reactions between PK and proteins or conjugated proteins, it was concluded that protein changes and cell membrane damage generated by ozone are responsible for E. coli and S. faecalis inactivation. Ozone is increasingly being used in the food industry to inactivate bacteria, fungi, viruses, and protozoans, especially resistant microbes. Studies have been undertaken to elucidate the action mechanism of ozone. Researchers have found that it can damage cell membranes (Scott & Lesher, 1963; Murray et al., 1965; Kim et al., 1999; Guzel-Seydim et al., 2004; Cho et al., 2010), facilitate protein denaturation and enzyme activity decrease (Hinze et al., 1987; Mehlman et al., 1987; Takamoto et al., 1992; Komanapalli & Lau, 1996), as well as destroy the nucleic acids of microbes (Scott & Lesher, 1963; Roy et al., 1981; Mura & Chung, 1990; Hunt & Mariñas, 1999). Other studies have investigated the effect of ozone on the spore inner membrane of Bacillus subtilis (Young & Setlow, 2004; Cortezzo et al., 2004), and on the spore morphologies of Bacillus atrophaeus as well as Geobacillus stearothermophilus (Mahfoudh et al., 2010). It was also showed that ozone inactivated Pseudomonas aeruginosa ATCC27853 by the combined results of increased cytoplasmic membrane permeability and cytoplasm coagulation, rather than by severe membrane disruption and cell lysis (Zhang et al., 2011). Ozone has numerous potential primary target sites during disinfection, giving researchers great difficulty in understanding its action mechanism. Hence, to promote the application of ozone as a disinfectant, further investigation from different perspectives is needed to ascertain the germicidal mechanism. EDTA or other chelating agents can lyse cells, and have specific targets in cells. Researchers have reported that cells treated with EDTA or other chelating agents become sensitive to antibacterial agents (Ayres et al., 1993). Meanwhile, antibacterial agents also influence bacterial cell lyses induced by EDTA or other agents (Munton & Russell, 1972; Russell & Vernon, 1975; Walsh et al., 1999). This may be ascribed to the effects of antibacterial agents on the specific targets, at which EDTA or other agents aimed. According to the inhibitor or promoter actions of antibacterial agents on the agent-induced lysis of bacterial cells, the targets of antibacterial agents in the cells could be deduced. Sodium dodecyl sulfate (SDS), sodium hydroxide (NaOH), and proteinase K (PK) can induce cell lysis. Wei (2008) studied the effect of ClO2 on the NaOH-, SDS-, and PK-induced lyses of Escherichia coli cells. However, few data are available on the effect of ozone on the agent-induced lyses of E. coli and Streptococcus faecalis cells. With the rupture of cells caused by physical, chemical, and biological effects, the OD600 values of suspensions decrease (Chen et al., 2010). ODs, measured by the spectrophotometric method, can be used to assess the cell the lyses of microbes (Ayres et al., 1993; Johnston et al., 2003; Arrieta et al., 2006). Otherwise, protein coagulation, changes in the microbial surface, or other changes in the opacity of cell constituents also affect the OD of cell suspensions (Walsh et al., 1999; Russell et al., 1973). It can be seen that, if cell lyses, protein coagulation, changes in the microbial surface, or other changes in the opacity of cell constituents occur, the OD600 value of microbial cells alters. Electron microscopy is commonly used as a powerful tool for investigating in detail the morphologies of microorganisms. In the present study, NaOH-, SDS-, and PK-induced lyses of E. coli and S. faecalis cells were used to estimate the effects of ozone on bacteria cells by OD600 alteration. Transmission electronic microscopy (TEM) images of NaOH-, SDS-, and PK-induced lyses of E. coli cells pre-treated with ozone, were observed. And cytoplasmic membrane permeability of S. faecalis cells treated with ozone was also investigated by ATP loss. The results may help optimize treatment protocols for microbial control using ozone. coli 8099 and S. feacalis ATCC29212 were obtained from the Guangdong Provincial Key Laboratory of Microbial Culture Collection and Application (Guangzhou, P.R. China). The chemical reagents, in addition to Luria-Bertani (LB) broth, and a bioluminescence-based ATP measuring kit, such as NaCl, Na2S2O3, NaOH, SDS, Na2(HPO3), and KH2PO3, were purchased from Huankai Microbiological Science and Technology Co., Ltd (Guangzhou, P.R.China). PK was from Sigma (USA). After inoculated shakily in 80 mL of LB broth for 20 h at 37 °C, the bacteria were centrifuged at 3000×g for 5 min. Then the pellets were washed three times, and resuspended in 0.85% NaCl solution. Ozonized water was prepared as described by Zhang et al. (2011). When ozone reached the required concentration for the experiment, 4 mL ozonated water was added into 2 mL cell suspensions. The mixture was then agitated for 10 s using a vortex mixer (Qite Analytical Instrument Co., Ltd., Shanghai, P.R. China) and incubated for 5 min. Finally, the residual ozone was neutralized for 10 min by 0.6 mL Na2S2O3 solution (5%, w/v). To detect the OD600 alteration induced by ozone, the E. coli 8099 cells were firstly exposed to 0.18, 0.30, 0.38, and 0.50 mg/L ozone for 5 min. And the S. feacalis ATCC29212 cells were firstly exposed to 0.24, 0.27, 0.42, and 0.48 mg/L ozone for 5 min. After quenching residual ozone, the treated solutions were divided into four 1.5 mL aliquots. The OD600 value of one aliquot was directly detected. The other three were centrifuged at 6500×g for 5 min. After carefully removing most of the supernatant, 200 μL was left in each of the three aliquots and fully stirred. Two of these three aliquots were respectively treated with 400 μL of NaOH (0.2 mol/L) and SDS (2%, w/v) for 3 min. The third aliquot was exposed to 10 μL of PK (2 mg/mL) at 37 °C for 30 min. For the three aliquots, 0.85% NaCl solution was added to achieve a final volume of 1.5 mL. These 1.5 mL final solutions were used to either determine OD600 value. To observe the effect of ozone on cell ultra structure, the E. coli 8099 cells were firstly exposed to 0.58 mg/L ozone for 10 min. After quenching residual ozone, the treated solutions were divided into four 1.5 mL aliquots. One aliquot was directly centrifuged for 5 min (6500×g), and the pellets were used to TEM investigation. The other three were also centrifuged at 6500×g for 5 min, and then the pellets were respectively treated with SDS, NaOH, and PK. The treated method was the same with the OD600 alteration above. The final volume of 1.5 mL was used to prepare ultrathin sections of TEM. To assay ATP loss from treated cells, the S. feacalis cells were treated with 0.37 mg/L ozone for 0.5, 1, 2, 3, 4, and 5 min. After quenching residual ozone, the mixture was centrifuged for 5 min (10000×g). Finally, 1 mL each mixed sample was directly collected to determine the suspension ATP concentration, 1 mL centrifuged supernatant was immediately used to assay the supernatant ATP, and the pellet that was resuspended in 1 mL sterilized water, was used to detect the pellet ATP (Zhang et al., 2011). The aforementioned experiments were conducted at room temperature and repeated three times for each treatment condition. For the control, 2 mL cell suspensions were treated with 4 mL sterilised water. All other isolation and analysis procedures were the same. Where N0 is the initial OD600 of the cells without ozone, and Nt is the final OD600 of cells treated with ozone, the three agents, as well as ozone plus the three agents. After the treatments with NaOH, SDS, and PK, each of the final 1.5 mL solutions of the three repeated samples prepared above were mixed and centrifuged at 4200×g for 5 min. The pellets were used to prepare ultrathin sections as described by Chen et al. (2010), with some modifications Zhang et al. (2011). The detections f supernatant ATP, spension ATP and pellet ATP were the same with the report of Zhang et al. (2011). In the study of OD600 alteration in E. coli cells, the suspensions with 1.757 of OD600 were respectively exposed to 0.18, 0.30, 0.38, and 0.50 mg/L ozone for 5 min. As shown in Figure 1, the OD600 reduction rates of E. coli cells exposed to ozone were between 6.11 ± 1.29%–7.06 ± 1.23%. The ozone concentration had a slight influence on OD600 alterations in the treated cells. The OD600 values of E. coli cells exposed to SDS, NaOH, and PK decreased by 8.83 ± 1.86%, 34.72 ± 0.42%, and 10.42 ± 2.08%, respectively. The treatment of NaOH, SDS, PK, and ozone damaged E. coli cells. 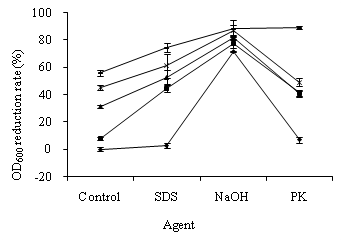 Compared with the single treatment of ozone, SDS, and NaOH, ozone pre-treatment caused a greater SDS-, and NaOH-induced OD600 reduction in E. coli cells (Figure 1). The OD600 decrease rates of E. coli cells, treated with ozone plus SDS and ozone plus NaOH, were between 18.67 ± 3.01%–64.33 ± 3.61% and 48.33 ± 3.72%–53.67 ± 3.25%, respectively. Therefore, E. coli cells pre-treated with ozone were susceptible to SDS and NaOH. In contrast, the OD600 reduction rates of E. coli cells, treated with ozone plus PK, were between 5.00 ± 1.14%–13.50 ± 2.17%. Compared with the single treatment of ozone and PK, ozone pre-treatment caused little PK-induced OD600 change in the E. coli cells. Therefore, the cells pre-treated with ozone became less sensitive to PK (Figure 1). In the study of OD600 alteration in S. feacalis cells, the suspensions with 0.602 of OD600 were exposed to 0.24, 0.27, 0.42, and 0.48 mg/L ozone for 5 min. As shown in Figure 2, the OD600 reduction rates of S. feacalis cells exposed to ozone were between 7.95 ± 2.81%–55.85 ± 1.43%. The OD600 reduction rate gradually increased with ozone dosage increasing. The ozone concentration had greater influence on OD600 alterations in S. feacalis cells than E. coli cells. The OD600 decrease rates of S. feacalis cells treated with SDS, NaOH, and P K were 2.85 ± 3.63%, 71.30 ± 1.08%, and 7.00 ± 2.47%, respectively. The treatment of NaOH, SDS, PK, and ozone damaged S. feacalis cells. Ozone pre-treatment caused a great SDS-, NaOH-, and PK- induced OD600 reduction in S. feacalis cells (Figure 2). The OD600 values of S. feacalis cells, treated with ozone plus SDS, ozone plus NaOH, and ozone plus PK, decreased by 44.82 ± 7.73%–74.51 ± 3.14%, 77.70 ± 3.29%–88.74 ± 1.87%, and 40.62 ± 2.99%–88.80 ± 1.82%, respectively. Therefore, S. feacalis cells pre-treated with ozone were susceptible to SDS, NaOH, and PK. To investigate the ultra structural changes in treated E. coli cells, the suspensions with 1.949 of OD600 were exposed to 0.58 mg/L ozone for 5 min. Compared with the control (Figure 3a), changes occurred in the ultra structure of E. coli cells treated with ozone (Figure 3b), NaOH (Figure 3c), SDS (Figure 3e), and PK (Figure 3g). However, the membrane structures of cells treated with ozone plus NaOH (Figure 3d) and ozone plus SDS (Figure 3f) exhibited more acute damage than the cells without ozone pre-treatment (Figure 3c and Figure 3e). Therefore, after ozone pre-treatment, the subsequent exposure to 0.2 mol/L NaOH and 2% (w/v) SDS produced more acute damage to E. coli cells than the cells without pre-treatment (Figures 3b–3f). In contrast, the treatment of ozone plus PK led little change to occur in the membrane structure of E. coli cells compared with ozone treatment (Figure 3b and Figure 3h)). Therefore, after ozone pre-treatment, the subsequent exposure to PK produced less alteration in the E. coli cells than the cells without pre-treatment (Figure 3b and Figures 3g-3h). The ATP loss from S. feacalis cells induced by 0.37 mg/L ozone for indicated time was assayed by the supernatant ATP. In time-dependent tests, ozone caused a rapid leakage of ATP from the bacterial cells in 0.5 min. Then, with the time increasing, the released content changed slightly. The extracellular ATP content from ozone-treated cells was between (0.12±0.00) ×10-8 mol/L and (0.16±0.02) ×10-8 mol/L in 5 min. This was higher than the control of (0.01±0.00) ×10-8 mol/L. The strain ATP and pellet ATP contents rapidly dropped after ozone treatment in 0.5 min, and then respectively plateaued (Figure 4). In the present study, the OD600 alteration of E. coli and S. feacalis cells occurred when the cells were respectively exposed to ozone, ozone plus SDS, ozone plus NaOH, and ozone plus PK (Figures 1-2). It was revealed that ozone treatment induced cell lyses, protein coagulation, changes in the microbial surface, or other changes in the opacity of cell constituents. OD600 alteration and TEM images of E. coli cells demonstrated that ozone did not give rise to cell lyses in our study. Firstly, the OD600 changes of E. coli cells produced by ozone were small. Secondly, compared with the ultra structural alteration of cells without ozone treatment (Figure 3a), ozone treatment generated cytoplasm coagulation and changes in cell wall and cell membrane, but not membrane disruption and cell lysis. The surfaces of E. coli cells exposed to ozone were smoother and thinner (Figure 3b). The decreased content of outer membrane proteins (OMPs) may reduce the compactness of the outer membrane so that the surfaces of cell became smoother and thinner. It was similar to the effects of ozone and rhamnolipid on Ps. aeruginosa (Sotirova et al., 2009; Zhang et al., 2011). It was assumed that OMPs changes caused by ozone may lead to the surfaces alteration. Therefore, E. coli inactivation caused by ozone may be ascribed to cytoplasm coagulation and protein changes in the microbial surface, not membrane disruption and cell lysis. Cell lysis caused by SDS was due to protein denaturation. Changes in related proteins will affect SDS-induced cell lyses. In our study, OD600 alteration and TEM images displayed that E. coli cells pre-treated with ozone were susceptible to SDS (Figure 1 and Figure 3). That is, ozone treatment boosted SDS-induced cell lysis. Compared with the ultra structural of cells without ozone treatment (Figure 3a and Figure 3e), after the treatment of ozone plus SDS, most cells maintained intact shapes but the numerous vesicles appeared as the rough structures on the cell surfaces and in cytoplasm (Figure 3f). Diao et al. (2004) reported that the vesicles on the cell surfaces could be cellular constituents leaking from the cells during treatment and indicated the increased permeability of cell membrane. The vesicles in cytoplasm could be cytoplasm coagulation. Therefore, it was concluded that ozone pre-treatment made SDS-induced permeability of cell membrane increase and cytoplasm coagulation occur, but membrane disruption and cell lysis not appear (Figures 3e-3f). Munton & Russell (1972) reported that, because protein-dialdehyde interactions in the outer lipoprotein layer blocked SDS access, SDS-induced lyses of E. coli cells pre-treated with glutaraldehyde (GTA) were prevented. The present results were different from Munton & Russell (1972). It may be due to the difference in disinfectants. Ozone-induced denaturation of related protein in the cell wall and membrane of E. coli cells may facilitate SDS access, not block SDS acces. OD600 alteration and TEM images also displayed in our study that E. coli cells pre-treated with ozone were susceptible to NaOH (Figure 1 and Figure 3). The treatment of ozone plus NaOH ruptured E. coli cells (Figure 3d). Cell lysis caused by NaOH can be attributed to cell membrane damage (Wei, 2008). Ozone-induced membrane damage of E. coli cells promoted NaOH-induced cell membrane damage. PK-induced cell lysis is due to the reactions between PK and proteins or conjugated proteins. In our study, little OD600 alteration and TEM images indicated that E. coli cells became less susceptible to PK (Figure 1 and Figure 3). 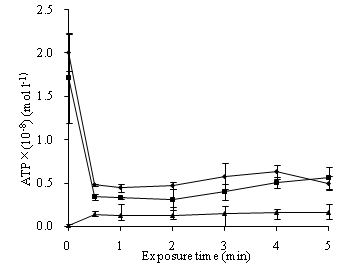 The effect of PK on E. coli cells treated with ozone was little (Figure 3b and Figure 3h). That is, ozone pre-treatment made E. coli cells not react with PK. Ozone-induced damage of proteins in the cell wall and membrane of E. coli cells may make PK be dysfunctional. Therefore, the OD600 alteration and TEM micrographs of E. coli cells revealed that ozone exposure generated protein changes and cell membrane damage so that changes in SDS, PK, and NaOH-induced lyses of E. coli cells took place. To understand the sterilization mechanism, how disinfectant acts on cell membrane, a very important structure to prokaryotes and eukaryotes, is of significance. Intracellular substances leakages can indicate membrane damage (Yeaman et al., 1998; Johnston et al., 2003; Kulakovskaya et al., 2003; Higgins et al., 2005). As the central energy carrier of all organisms, ATP loss also can be the indicator of membrane damage (Paul et al., 2010; Zhang et al., 2011). In our study, ATP leakages from S. feacalis cells treated with ozone, displayed by the supernatant ATP, arose immediately (Figure 4). Therefore, ozone damaged cell membranes of S. feacalis cells and increased membrane permeability. It was also found that the strain ATP and pellet ATP of S. feacalis cells dropped after ozone treatment. This was not identical to Ps. aeruginosa cells (Zhang et al., 2011). Zhang et al. (2011) reported that the contents of suspension ATP and pellet ATP of Ps. aeruginosa cells rapidly increased within 1 min of ozone treatment and then respectively plateaued. Further study is needed to illuminate the discrepancy. OD600 alteration stated that the effect of ozone on S. feacalis cells was a little bit different from E. coli cells (Figures 1-2). Changes in the OD600 of S. feacalis cells treated with ozone were greater than E. coli. At the same time, ozone pre-treatment made S. feacalis cells be sensitive to SDS, NaOH, and PK. However, treated E. coli cells were susceptible to SDS and NaOH, not sensitive to PK. The different cell structure between the gram-positive bacterium of S. feacalis and the gram- negative bacterium of E. coli may bring about the different results. It is needed to further investigate on the precise mechanism of the interaction of ozone with the proteins and cell membrane of microbes. And the morphological observation on S. feacalis cells treated with ozone also needs to be carried out in the future. In summary, ozone treatment produced protein changes and cell membrane damage so that changes in the SDS, PK, and NaOH-induced lysis of S. feacalis cells took place. The cellular permeability of S. feacalis cells also increased after ozone treatment. This study was supported by the Guangdong Provincial Strategic Emerging Industry Core Technology Research Project (No. 2012A032300018). The authors would like to thank Mr. Cheng-Si Li and Ms. Ai-Ling Zhang of Guangdong Institute of Microbiology for their kind help in ATP measurements and electron microscopic observation. Figure 2. Effects of agents on the OD600 of Streptococcus faecalis cells treated with different ozones for indicated time (◆) 0 mg/L; (■) 0.24 mg/L; (▲) 0.27 mg/L; (×) 0.42 mg/L; (―) 0.48 mg/L. Values are represented as the mean ± SD of data from three replicate experiments. Figure 3. 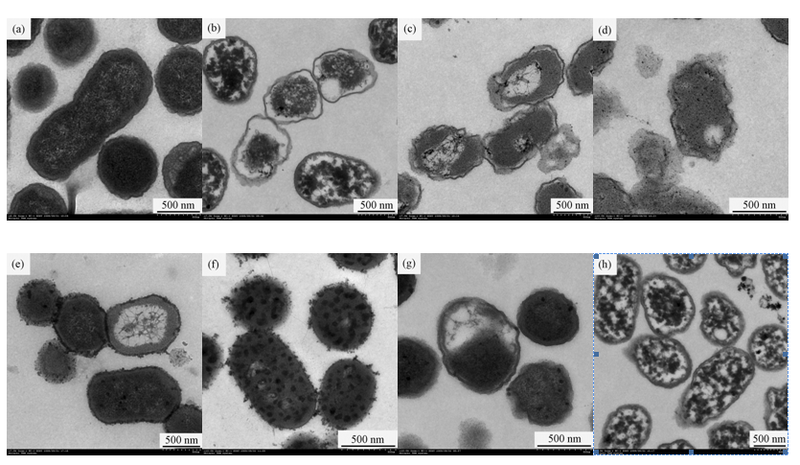 TEM photographs of Escherichia coli cells treated with (a) sterilized water, (b) ozone, (c) sodium hydroxide (NaOH), (d) ozone plus NaOH, (e) sodium dodecyl sulphate (SDS), (f) ozone plus SDS, (g) proteinase K (PK), and (h) ozone plus PKexperiments. Figure 4. Time-dependence of ATP loss from Streptococcus faecalis cells exposed to 0.37 mg/L ozone for indicated time. (▲), supernatant ATP, (◆) suspension ATP; (■) pellet ATP. Values are represented as the mean ± SD of data from three independent experiments.